Post-traumatic stress disorder, or PTSD, is a condition that occurs for some individuals following a traumatic event. It first came to prominence following World War One. 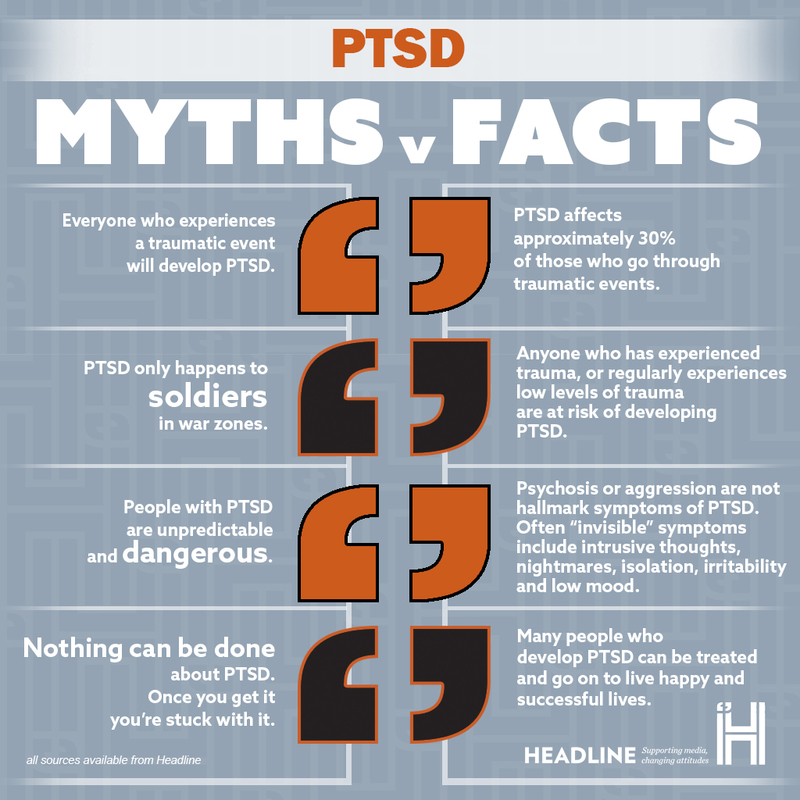 In this section you will find guidelines on reporting on PTSD, myths and facts, as well as a definition about the condition. Words like ‘nutter’, ‘crazy’, or ‘madman’ to describe someone with PTSD can be extremely upsetting to those impacted by the condition and add to the stigmas surrounding mental health. This can, in turn, prevent or discourage people seeking support when they need it. Where possible, include comments from mental health care professionals, and individuals living with PTSD, in order to provide accurate and non-sensational information. Think about providing warnings at the beginning of articles or programmes, as reading reports of PTSD can be triggering for people living with it. Consider if mentioning a diagnosis of PTSD is relevant to the story. Many people are not comfortable with diagnoses being disclosed, and reporting a case of PTSD when it isn’t relevant can risk linking the condition to behaviours such as violence. 1000s of people living in Ireland manage their PTSD well, and many go on to have full recoveries. Include positive stories about people living successfully with PTSD. Think about whether images included in the article are necessary, as they may be triggering or helping to spread misconceptions about PTSD. PTSD, or post-traumatic stress disorder, is a mental health condition which is caused by frightening or distressing events such as serious accidents, abuse, assault, military combat, or witnessing violent death. It can occur at any age, including childhood. Symptoms can include flashbacks, nightmares, avoidance of people or situations, irritability or anger, depression, and guilt.